Looming high over the Seoul landscape at 238m, the N Seoul Tower is one of the city's national landmarks and main attractions. Also known as the Namsan Tower because of its actual location atop Namsan Mountain, it was constructed in 1969 and completed in 1971, but wasn't opened to the public until 1980. 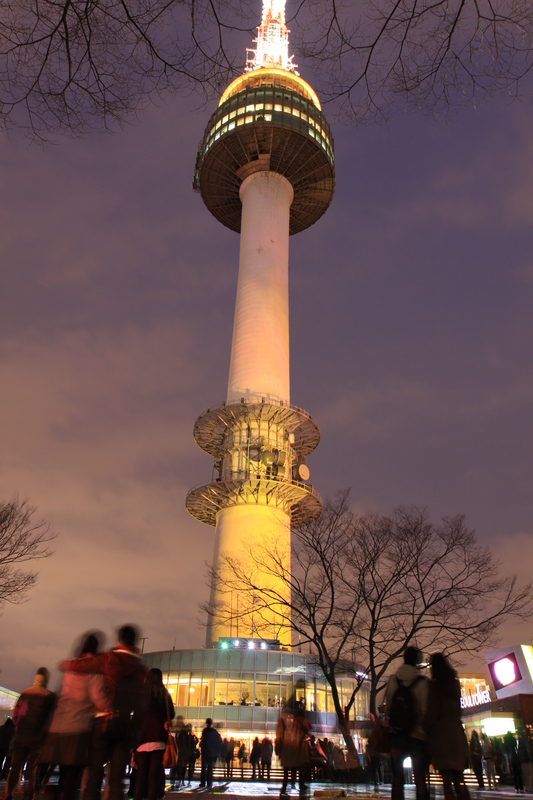 The N Seoul Tower is mainly used as an integrated transmission tower that regularly beams radio and TV broadcasts, equipped with transmission antennas from Korean media sources like KBS, MBC, SBS TV, FM, and more. But it’s also become a must-visit tourist stop, because of the breathtaking panoramic views of Seoul and the surrounding areas that it offers. In 2005, the Tower underwent extensive renovation and remodeling that cost over 15 billion. This project added many attractions and facilities, and when it was done, the tower was renamed the N Seoul Tower, with "N" standing for either "New," "Namsan," or "Nature." The tower uses the latest LED technology to create dynamic light displays at night, offering visitors an amazing digital and cultural experience through "light art." The free light shows are enjoyed by many tourists, and often incorporate different themes, such as "Shower of Light" or "Reeds of Light." A museum, gift shop, and four observation decks await visitors inside the N Seoul Tower, including the Digital Observatory, which provides a stunning 360° panoramic view and 32 LCD screens that showcase Seoul's 600-year history. A Roof Terrace where visitors can attach padlocks on the fences as a symbol of love is a popular tourist activity, and these "Locks of Love" have been depicted in many Korean movies and TV shows. Visitors who wish to dine amidst a spectacular view of the cityscape can do so at several restaurants located in the tower, which include a Sweet Bar, burger joint, Sky Lounge, Italian casual dining (The Place), traditional Korean (Hancook), and French fine dining (n.Grill). The latter is a revolving restaurant that rotates at a rate of one revolution every 48 minutes, giving you an amazing view that complements your high quality meal. See for yourself what the N Seoul Tower has to offer with our various tour packages at All Seoul Tours. We offer stops to the N Seoul Tower on our Fresh Seoul Morning Tour Plan and the From Ancient to Modern Namsan Hanok Village and Panorama View N Seoul Tower Tour, as well as other city tours. Contact us today for more details.